Want to get your kids to eat a WHOLE large carrot?? 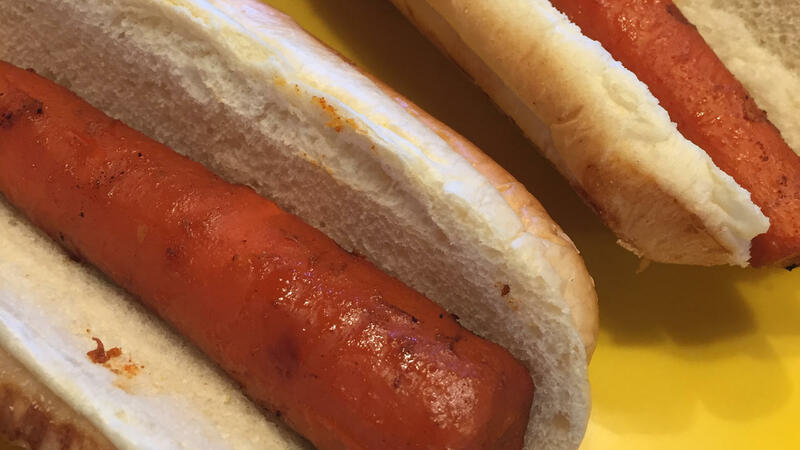 This delicious recipe amazingly turns ordinary carrots into vegan “hot dogs” that are smoky, tangy and irresistible! The longer you marinate them, the more flavor they will have. Pop them on the grill and top them with sautéed onions and YUM! I hope your family loves them as much as mine. P.S. To choose the best carrots, it helps to look through the bags at the store and choose the fattest carrots that do not taper as much on the narrow end. It can be helpful to buy a larger bag than you need to be able to choose the 8 best carrots for your Carrot Hot Dogs. First, heat the stove on high and half fill a large pot with water. As the pot of water boils, complete the next steps. Heat grill to medium high heat. If possible, have the bag of marinating carrots brought to room temperature prior to grilling. Using tongs to remove the carrots from the marinade, place them on the hot grill and turn occasionally to make grill marks. Grill until heated through thoroughly, approximately 10 minutes. If possible, have another cook prepare the sautéed onions so they are hot and ready when the Carrot Hot Dogs come off the grill. In a medium skillet, heat on stove to medium. Add oil. Add sliced onions. Stir occasionally. If they are browning too quickly, turn down the heat to medium low, so they cook slowly and get very soft before they get too brown. Remove from heat. Add salt to taste. Top each Carrot Hot Dog with some sautéed onions and other toppings of your choice.